10 minute walk to beach/ Beach passes, Bicycles,Swing Set, BBall Hoop, Front Porch/Screened in Back deck with lighting/Grill;Gazebo/sitting area in back yard;Outdoor shower. My mom built this house in 1997. She recently passed away. I have left the house basically as she had it with her artwork and furniture. It is not a typical beach cottage, but rather a year-round home that has been meticulously maintained and cared for.I have added an outdoor shower and screened in the back deck with permanent screening and lighting. It has a handicap ramp in the back and is clean and brightly decorated. Far enough away from the bars and crazy nightlife noise, yet close enough to walk to the beach, the house is 800 yards from the ocean, an 8-10 minute walk or 2 minute drive. Biking is a great option. My name is Larry Adams. I live about 3 miles from the house and make myself available for any needs that might arise during your stay. Feel free to contact me with questions or needs. A welcome packet awaits you with everything from restaurant menus to internet codes. My mom built this house in 1997. She recently passed away. I have left the house basically as she had it with her artwork and furniture. It is not a typical beach cottage, but rather a year-round home that has been meticulously maintained and cared for. I have added an outdoor shower and screened in the back deck with permanent screening and lighting. It has a handicap ramp in the back and is clean and brightly decorated. Far enough away from the bars and crazy nightlife noise, yet close enough to walk to the beach, the house is 800 yards from the ocean, an 8-10 minute walk or 2 minute drive. Biking is a great option. Bathroom on main floor has integrated shower seat and handicap hand holds near toilet. Pillows, bed spreads, and blankets are provided. Bed linens, pillow cases, bath towels are provided upon request for $50. Good location & well equipped. Minimal linens provided.. just a few washclothes and hand towels. Westerly has beautiful beaches & this house is close. Furniture not as pictured; old & worn, house could use some sprucing up, but overall filled our needs for a beach vacation. Linens not all included. 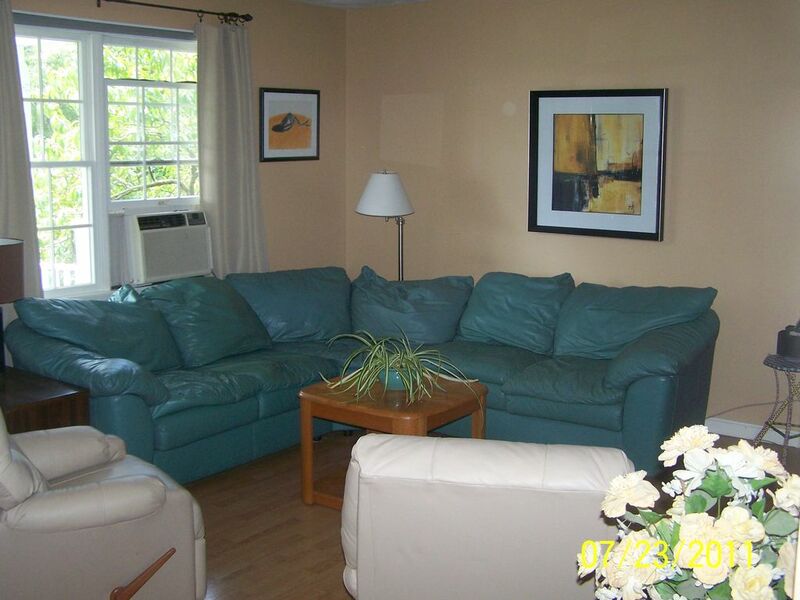 All the other properties we have rented include sheets, bath & beach towels. Since we were driving up from FL it took up a lot of our car space to bring these items. 111 Winnipaug was a great property to rent for our family. We had a great week at Marion's house!! Everything worked well inside and the backyard and driveway were hits for playing ball, swinging and biking. I loved the large oaks for shade in the backyard too. The screened porch was a very much appreciated. We used the outside shower and hoses to remove sand and salt. My daughter, son in law and 2 boys were upstairs and we were down. The separation worked well as we are on different schedules and we were nicely isolated in the downstairs bedroom. The parking and beach passes were a big help! There was no pressure to get to the beach early to get a parking space. Having the bathrooms at the Fireman's District Beach was good too. It was nice to know that you and Deb were available to handle problems. We thoroughly enjoyed our stay during whay had to be the busiest time of year. The house is on a busy road, but is set back. We worried about beach parking when cars were already lined up in front of the house by 8am! But the private beach parking permit was a vacation saver. There was plenty of parking at 9:30 when we made it down there. Walking down to the beach was not doable with young kids and all our stuff and I would say we are a pretty active family. The house came equipped wth lots of cooking utensils, spices, paper supplies, etc. The multiple air conditioners were also super helpful for the hot week we had. There was also a basketball hoop which the kids loved and plenty of beach supplies. It was by a farm reserve, which made a nice walk down to a sandy beach area with the dog. A little further down was a Audobon park with some walking trails, which also made for a nice walk..although sadly, dogs are not allowed. Overall, a great place to stay! The house was in great shape and close to beach, shopping, and restaurants. Swing set , screened porchand big back yard saw a lot of use by our grandkids while we were here visiting my Mom at a nearby nursing home and other relatives across the state. Quick drive to Mystic Aquarium and Seaport. We are a family of six; one Mom, two adult daughters, one son-in-law, two tweens and Chloe the pug. Marion's home is lovely, comfortable and ideally located for accessing the beach or any other activities offered typical of a family vacation. The house provides all the amenities one could hope for in a rental property. We found ourselves congregating on the screen porch at night to talk, read or play a board game and again to enjoy our breakfast al fresco. We would happily request to rent Marion's home again without hesitation. Pets must be pre-approved. No smoking is allowed in house or on decks or patios. A sitting area is located in the back yard for smoking.